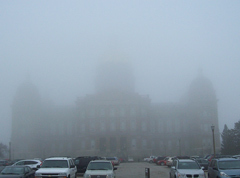 Many parts of Iowa were covered in ice, while the Iowa Statehouse was covered in fog Monday. Temperatures will be on a roller-coaster in Iowa this week. Much of the state was coated in ice on Sunday, but a warm front is moving across Iowa today, bringing temperatures in the 40s and 50s. Meteorologist Miles Schumacher, at the National Weather Service, says it’ll get warmer before it gets colder. Schumacher says parts of southeast Iowa will see highs in the 60s on Tuesday along with what may be the first thunderstorms of the year in the afternoon. That warm spell won’t last long, though. Temps will fall during the day on Tuesday and highs for the rest of the week may only be in the teens and 20s. Friday may be the coldest day this week with highs of only 5-degrees in the south and 5 to 10-below zero in the north. There should be a slight warm-up by the weekend, with highs perhaps in the 20s and 30s.